Scenes from a Junkyard Planet: Your American Recycling Bin, at Home. During the run-up to the November 12 release of my first book, Junkyard Planet: Travels in the Billion Dollar Trash Trade, every weekday I’m posting a new photo taken during my decade of reporting on the global waste, recycling, refurbishment, and repair trade. Today’s image is mean to contrast with yesterday’s. As always, click for an enlargement. Taken high atop the technologically-advanced recycling line at the Houston Material Recovery Facility (owned by Waste Management Corporation, the largest recycling company in the United States), this January 2012 image shows workers – known as ‘pickers’ in the industry – searching for trash among the recyclables (most of which were generated in Houston households). 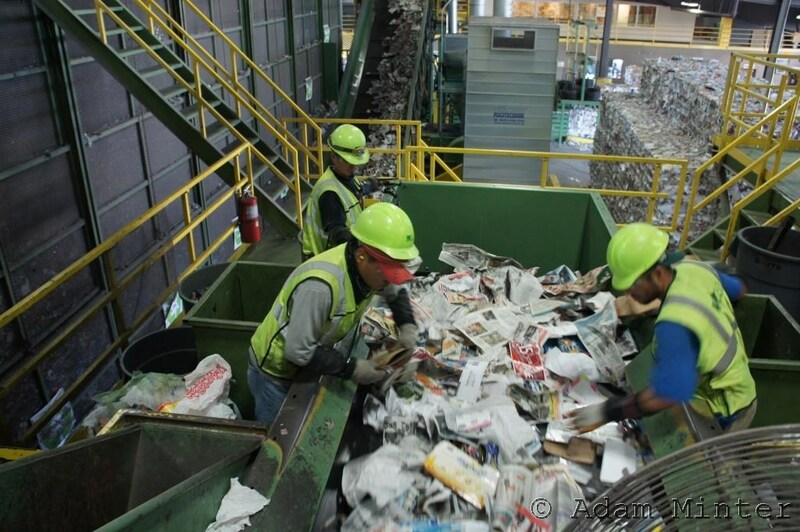 They pick the trash out before the conveyors move the stream into mechanical sorting equipment. Note, in the background, the mountains of baled-up paper awaiting shipment to a mill. It’s a similar function to the one played by pickers at Chinese paper mills that purchase imported scrap paper, highlighting – in my view – the importance of manual labor to recycling, no matter where it’s done, or how much the labor costs.